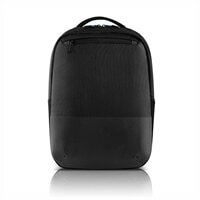 Dell Pro Slim Backpack 15 (PO1520PS)Keep your laptop, tablet and other essentials securely protected within the eco-friendly Dell Pro Slim Backpack 15 (PO1520PS). Make a positive impact on the environment by choosing this backpack made from more earth-friendly processes that have a reduced carbon footprint, and consuming less energy. The backpack’s built-in, padded sleeve fits your up to 15-inch laptop and a dedicated pocket for your tablet helps keep all your devices protected. Grab the lightweight backpack’s padded top handles or sling the slim-fit backpack over your shoulders to go hands-free. Breathable air mesh padding and contouring “S” shoulder straps will keep you cool and comfortable all day long. Stay safe with reflective accents on the backpack. 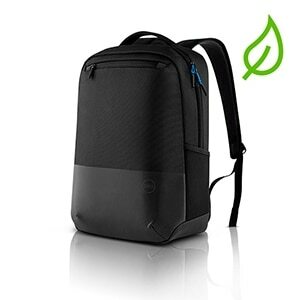 The eco-friendly Dell Pro Slim Backpack 15 (PO1520PS) provides quality protection for your devices. Keep your laptop, tablet and other essentials securely protected within the eco-friendly Dell Pro Slim Backpack 15 (PO1520PS). Made from earth-friendly solution-dyeing processes that generates 90% less wastewater, 62% less CO2 emissions, and uses 29% less energy than traditional dyeing processes. A water-resistant protective coating, made from reclaimed automobile windshields, ensures your devices will remain dry in wet, stormy weather. Slide your up to 15-inch laptop into the backpack’s built-in, padded sleeve and place your tablet into the dedicated pocket to ensure your devices will be protected wherever your busy day takes you. With breathable air mesh padding and contouring “S” shoulder straps, you’ll remain cool and comfortable carrying the backpack equipped with reflective accents all day long. Whether you’re heading out to work or embarking on your next travel adventure, simply grab the lightweight backpack’s padded top handles and be on your way. Sling the backpack over your shoulders to go hands-free. You’ll stay comfortable and cool embraced by the backpack’s “S”-shaped straps that contour your shoulders and an air mesh back panel. Securely store your important documents and everyday supplies in the backpack’s spacious interior compartment with pockets. Drop keys, coins and other small essentials in the zippered front pocket and carry water bottles or umbrellas within exterior mesh pockets so all your essentials are within reach while you’re on-the-go. Reflective accents on the pack and straps will help make you more visible to motorists during early morning and evening hours when you’re carrying the Dell Pro Slim Backpack 15 (PO1520PS). 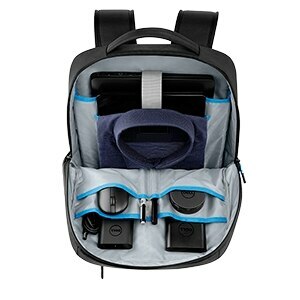 The backpack’s built-in padded laptop sleeve and tablet pocket keep your devices protected from bumps. 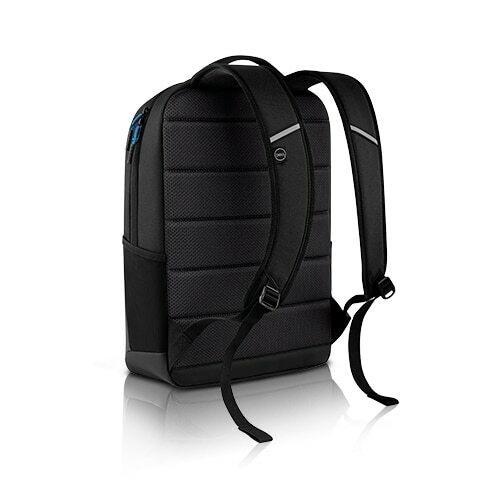 The Dell Pro Slim Backpack 15 (PO1520PS) holds most Dell laptops, up to 15-inches, for maximum protection wherever your busy day takes you. Keep your laptop, tablet and other essentials securely protected within the eco-friendly Dell Pro Slim Backpack 15 (PO1520PS). Make a positive impact on the environment by choosing this backpack made from more earth-friendly processes that have a reduced carbon footprint, and consuming less energy. The backpack’s built-in, padded sleeve fits your up to 15-inch laptop and a dedicated pocket for your tablet helps keep all your devices protected. Grab the lightweight backpack’s padded top handles or sling the slim-fit backpack over your shoulders to go hands-free. Breathable air mesh padding and contouring “S” shoulder straps will keep you cool and comfortable all day long. Stay safe with reflective accents on the backpack.